The Goliath birdeater spider is one of the largest spiders in the world. It is a tarantula. It lives in burrows in swampy areas of northern South America. It eats insects, rodents, bats, small birds, lizards, frogs, and snakes. The spiders have fangs, but their venom is harmless to people. Hairs on their bodies can irritate human skin. Explorers named the spider when they saw one eating a hummingbird. The female lays 100 to 200 eggs. The babies hatch in two months. The female spiders sometimes eat their mates. Females can live about 20 years, but males only live 3 to 6 years. These spiders can have a leg span of up to 28 cm (11 in) and a body length of up to 11.9 cm (4.7 in). They can weigh up to 175 g (6.2 oz). The spider's living areas are threatened by real estate development. 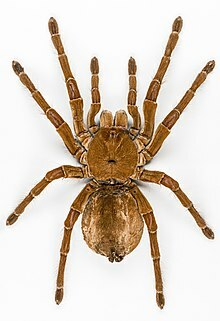 Wikispecies has information on: Theraphosa blondi. This page was last changed on 15 June 2016, at 15:12.